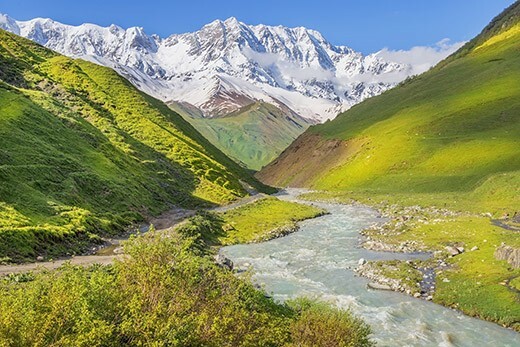 Explore the mysteries of the majestic Greater Caucasus in Georgia! Visit Georgia to explore the mysteries of the majestic Greater Caucasus! 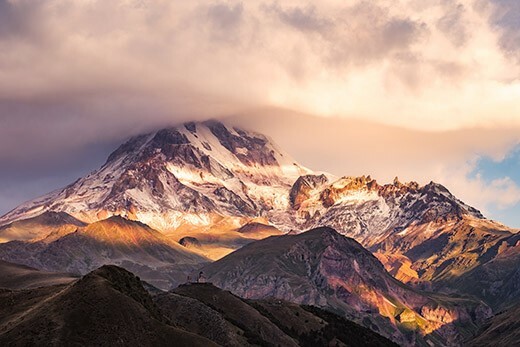 Come and see the highest peaks in Georgia: Kazbek, Ushba and Shkhara. Feel the thrill on the picturesque route – Georgian Military Road. Get a peek at secluded villages once considered as the highest located settlements in Europe and take off-road cars. 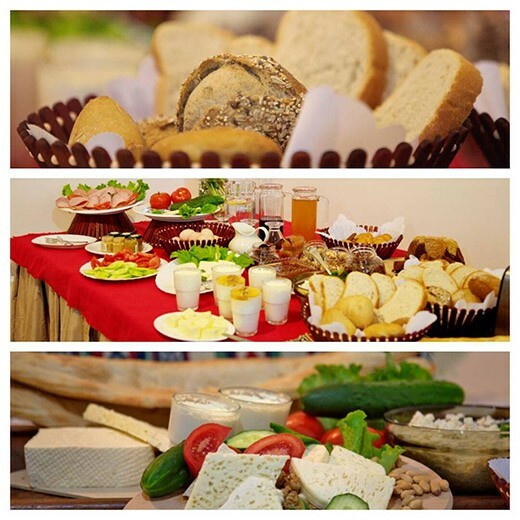 Be ready for the exquisite local cuisine and enjoy the best wine in Kakheti – the cradle of wine. Discover the Georgian strength hidden in rock fortresses. Take a look at great tserkovs and monasteries and make sure you know what is hidden in the Cave of Prometheus. 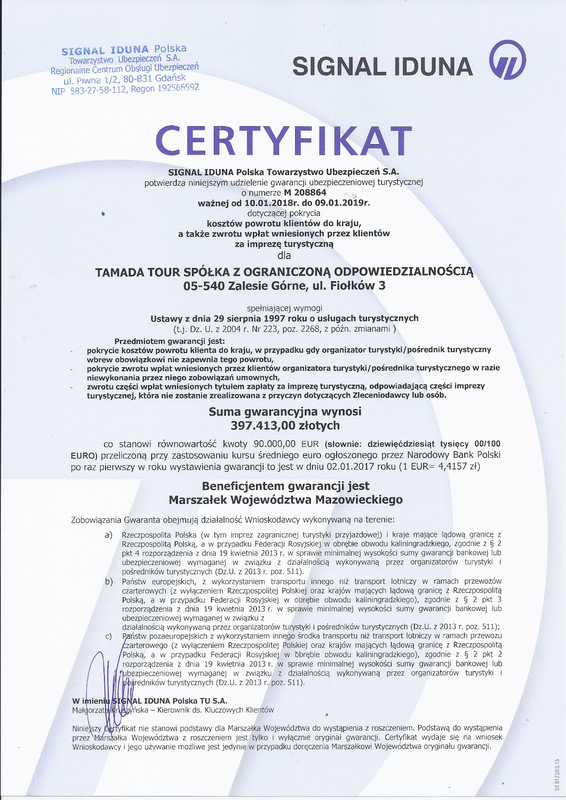 Dla tych, którzy w sercach mają góry, ale cenią też komfort podróżowania i niespieszne tempo. Ruszymy szlakiem najwyższych szczytów Gruzji, ale ze stosownej perspektywy, dostępnej dla każdego! W cenie jest wszystko, m.in. 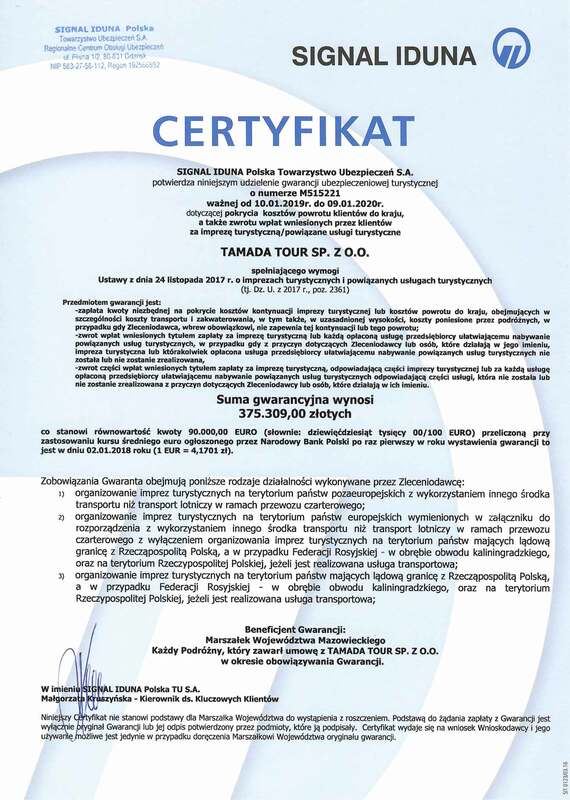 : bezpośredni przelot LOT-em na Warszawa-Tbilisi-Warszawa, komfortowe *** hotele w centrum miasta (TBILISI, KUTAISI, MESTIA, BATUMI, ACHALCICHE, TELAVI), śniadania w hotelach i CODZIENNIE obfite obiadokolacje w lokalnych restauracjach, najlepsi piloci-pasjonaci-specjaliści od Gruzji, codziennie wino do posiłków, liczne degustacje i atrakcje, bilety wstępu, prawdziwe codzienne życie, wspaniała gruzińska kultura i najpiękniejsze widoki, a to wszystko w KAMERALNEJ 16-osobowej grupie i znakomitej atmosferze. From Mestia, the heart and capital city of Svaneti, we’ll take jeeps to reach the spectacular Ushguli. Ushguli a community of villages used to be one of the highest continuously inhabited settlements in Europe. After a great avalanche in 1987 four villages: Zhibani, Chvibiani, Chazhashi and Murqmeli enlisted in UNESCO can be visited mainly in summers as winter snows shut them off for six months. At the height of 2,200 m over the sea level we’ll visit folkloric museum and Tower of Love, we’ll see ikons of saints in a local chapel and pieces of work of Fridon Nizharadze and listen to touching folk music. We’ll meet people, the descendants of builders of Svaneti defensive towers who reside in houses unchanged for generations and have a spectacular view on Shkhara - the highest peak in Georgia (5,193 m above the sea level). Caucasus Mountains stretching across Georgia, Azerbaijan and Russia will captivate us with their strength of wilderness. We’ll walk through green hallows and azure ponds surrounded by rocks. We’ll take crushed stone paths in precipitous gorges, where rustling crystal creeks and waterfalls can be heard. We’ll walk on steep hillsides surrounded by grown beeches, firs and spruces. These hillsides will frighten us with danger but reward us with spectacular view. We’ll discover unreachable snow-capped highest peaks of Greater and Lesser Caucasus: Shkhara and Kazbek among others. Caucasus Mountains will make us feel that we are a small part of big and indomitable nature. Arrival in Tbilisi where we’ll be welcomed by Tamada Tour guide, transfer from the airport to hotel. Rest. Breakfast. Sightseeing the beautiful capital city of Georgia: Tsminda Sameba (20th cent. ), fortress of Narikala (6th – 8th cent. ), tserkov Anchiskhati Basilica of St. Mary (5th – 6th cent. ), tserkov Metekhi (13th cent. ), Tbilisi Sioni Cathedral (11th -12th cent. ), and the Tbilisi sulfur baths including the world famous Orbeliani Baths (19th cent.). 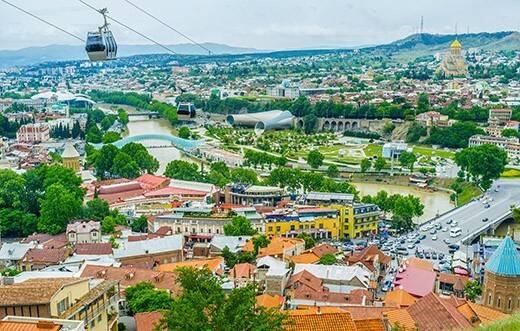 Taking a gondola lift to see the monument of the Mother of a Georgian (20th cent.). Sightseeing the Tbilisi old town and monuments on Rustaveli Avenue: The Freedom Monument, the house of the former Parliament, theater, opera erected in oriental style, philharmonic hall, the Kashveti tserkov (19th cent. ), and old-time Palace of Caucasus Viceroy. Free time and dinner restaurant with live music and dancing. Accommodation in hotel. Breakfast. We go through the Georgian Military Road to Stepantsminda (Kazbegi) to see an inactive volcano Mount Kazbek (5,033 m over the sea level). On the way to the destination point we’ll admire a magnificent fortress of Ananuri (16th – 17th cent.) 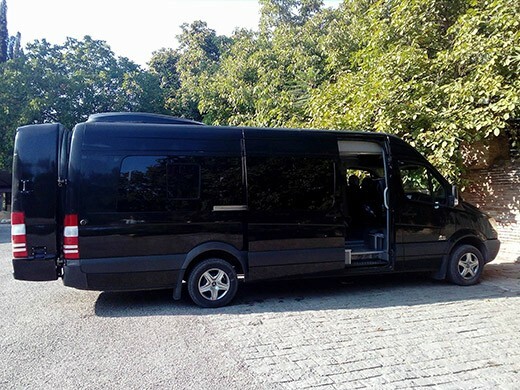 which is located on the large water reservoir Zhinvali and by off-road cars we’ll to go to the world famous Gergeti Trinity Church (2170 m above the sea level), from which the snow-capped peak of the Kazbek can be spotted. Return to Tbilisi. Dinner on the go. Accommodation in hotel. Breakfast. 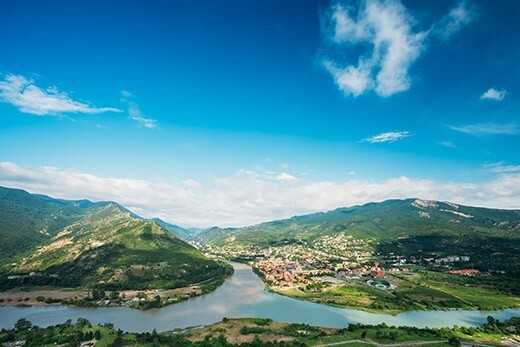 We head to Mtskheta – the former capital of the Kingdom of Iberia, where we can admire monuments enlisted in the UNESCO Intangible Cultural Heritage List. We go up to the Jvari tserkov (6th -7th cent.) with a breathtaking view on the city and two main rivers Mtkvari and Aragvi. The next place is the Svetitskhoveli Cathedral (11th cent.) famous for religious artifacts and impressive frescoes. Free time. Another destination is nunnery Samtavro (4th cent.) in which Georgian rulers who converted to Christianity in 337 on behalf of the whole country are buried. The plan is to visit a rocky city of Uplistsikhe (5th cent.) a former home for rulers and a center of pre-Christian cult. We’ll go to Gori a city famous for birthplace of Joseph Stalin. We go further through the Surami Pass in order to get to one of the oldest urban complexes in the world – Kutaisi (17th -15th cent. B.C.) to recognizable for legends about Jason and Prometheus. Dinner. Free time. Volunteers can take a walk to the city center to see theater and opera house and a fountain with reproduced sculptures which were found in Georgia 5,000 years ago. Accommodation in hotel. Breakfast. Sightseeing a present-day headquarters of the Georgian Parliament (since 2012) and the Bagrati Cathedral (6th cent., reconstructed in the 20th cent. ), the Gelati Monastery (12th – 13th cent.) with its three tserkovs and Gelati Academy known as “a second Athos” or “a new Jerusalem in which studied prolific Georgian and Greek philosophers. Moreover, the king David IV of Georgia (known as David the Builder) was buried in that place. 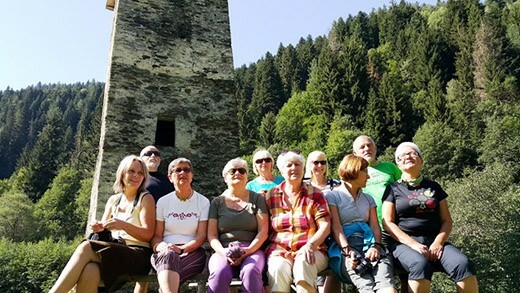 The last attraction is the astonishing Cave of Prometheus We’ll go to Mestia – the charming heart of Svaneti – famous for medieval defensive towers enlisted in the UNESCO Intangible Cultural Heritage List. Dinner in restaurant. Free time. Accommodation in Mestia. Breakfast. We’ll take jeeps to reach the spectacular Ushguli – a community of villages used to be one of the highest continuously inhabited settlements in Europe (2,200 m above the sea level) overlooking the highest peak in Georgia: Shkhara (5, 193 m above the sea level) and we’ll visit folkloric museum and Tower of Love. Return to Mestia. Dinner in restaurant. Free time. Accommodation. After breakfast, we’ll drive to the Black Sea and visit a palace-museum in Zugdidi in which one of Bonaparte’s masks is stored. Attractions also include the charming Botanical Garden (19th cent.) in Batumi, a walk across the seaside boulevard where you can see harbor and the impressive Alphabetic Tower – an impressive sculpture depicting 33 letters of Georgian alphabet. Free time. Dinner in Batumi. Accommodation. Breakfast. Free time. We go off to Sarpi, the westernmost point of Georgia located near the border with Turkey overlooking the mosque with minaret. On the way back, we can admire the Roman fortress from the 2nd cent. B.C. (fortress of Gonio – formerly Apsaros) where according to the legend Saint Matthias is buried. Dinner in Batumi. Evening concert accompanied by dancing fountains. Accommodation. Breakfast. We head to Akhaltsikhe, which used to be headquarters for Russian army at tsarist times. Another attraction is the SPA resort town of Borjomi. Then, we take a walk across Borjomi Central Park (20th cent.) to taste this exquisite, sanative water directly from the spring. Dinner in restaurant. Accommodation in Akhaltsikhe. Breakfast. Attractions include: the medieval architectural phenomenon: the town of Vardzia (12th – 13th cent. ), Khertvisi fortress (2nd – 12th cent.) and a medieval slave market. A small coffee break and return to Tbilisi. Dinner in restaurant. Accommodation in hotel in Tbilisi. Breakfast. 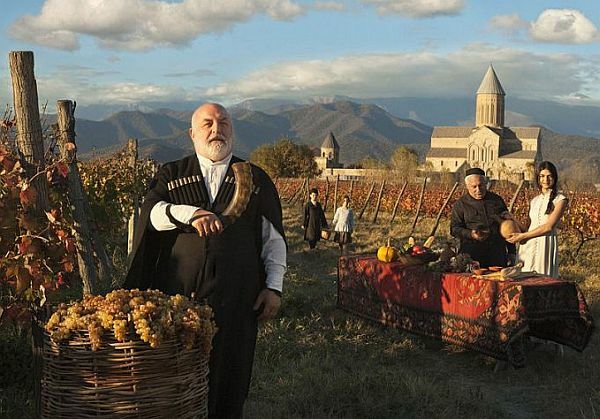 We go Kakheti, the cradle of winemaking, where 70% of domestic wine production is made. Another attraction is spectacular Sighnaghi (18th cent. ), known as Georgian Carcassonne, a perfect observation point which is situated atop a high mountain and surrounded by a fortified wall and numerous bastilles. Then, we’ll go to Bodbe Monastery (9th – 17th cent. ), a nunnery town, where a tomb of Saint Nino from Cappadocia (who introduced Christianity in Georgia) can be visited. We also go to a branch of Georgia National Museum, which presents the exhibition of the works of primitivist artist Niko Pirosmani and a collection of sculptures which date back to 5,000 years ago! Wine tasting in a traditional winery. Return to Tbilisi. Dinner. Accommodation in hotel. Preparation for return. Dry provisions for breakfast. transfer to airport. Departure.